Marnia Johnston is a sculptor and interdisciplinary instigator collaborating with engineers, synthetic biologists, programmers and tinkerers. She creates projects exploring what Donna Haraway calls the “ideological struggle between life and social science”. 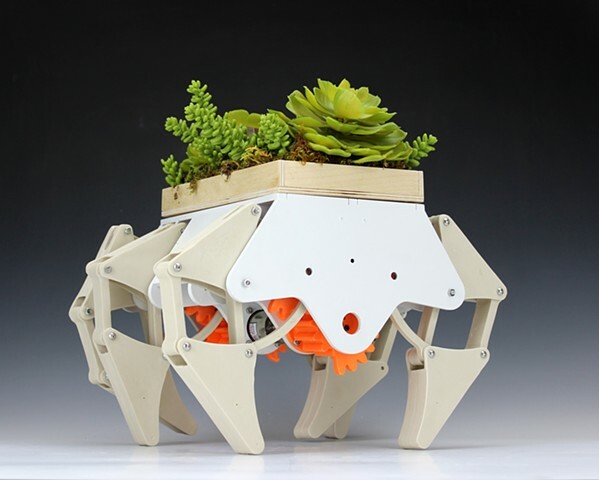 Marnia’s work does this by incorporating themes surrounding mass production, ecology and biological processes by using robotics, ceramics and various other media. Marnia has been awarded the Visions from the New California Award, a James Irvine Foundation Fellowship and completed a residencies at the Exploratorium, Watershed Arts Center, Anderson Ranch and at the John Michael Kohler Arts/Industry residency. Her sculptures and drawings have been exhibited widely, most recently at the Museum of Contemporary Craft, MOP Gallery Australia, Kala Art Institute and The American Museum of Ceramic Art, in Pomona California. Her work can be found in the permanent collection of Jingdezhen Ceramic Art Museum and the Icheon World Ceramic Center. Her work has been recognized by the World Ceramic Biennale, South Korea with two diplomas of honor and a medal of honor. Born in California, Johnston holds a BFA from San Jose State University and MFA from the California College of the Arts (CCA). She continues to sculpt out of her studio in the Castro in San Francisco, CA.